This past Thursday marked Opening Day for Major League Baseball and with it, a day of milestones for baseball fans across the country. To start off, the Mets beat the Nationals 2-0. Mets’ Jacob deGrom pitched 10 scoreless innings, while Nationals’ Max Scherzer struck out 12 and allowed only two hits in a little over seven innings. This was just the second time opposing Opening Day starters both reached 10 strikeouts, matching the feat accomplished by Sam McDowell and Dave McNally in 1970.
deGrom got Ryan Zimmerman to line out to third with two on in the first inning. He also got out of a first-and third jam in the third inning by striking out Trea Turner and getting and double play as a result of some bad baserunning from Victor Robles. In the sixth, with Turner on third and one out, deGrom struck out Juan Soto with a changeup. For the Mets, deGrom now has 25 consecutive quality starts and a record 30 consecutive starts, allowing only three runs or fewer. Next, the Yankees beat the Orioles 7-2. Making his Yankee debut on August 2nd, Luke Voit got up to bat with two runners on in the first inning and launched a 428-foot home run off Andrew Cashner at 112.6 mph to center field. Voit had a perfect day for the Yankees, reaching base in all four of his plate appearances: the home run, two walks, and a hit by pitch. 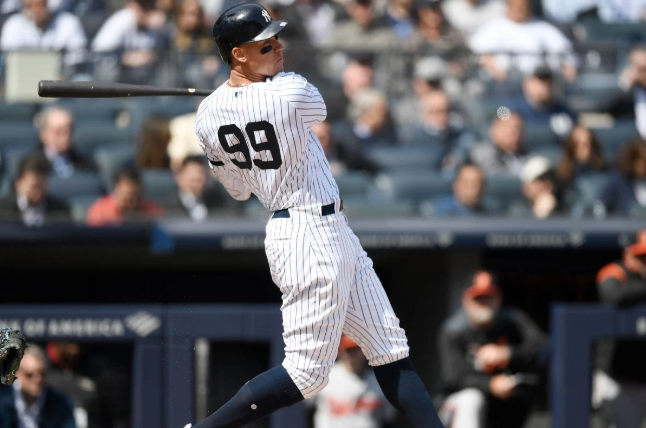 The Yankees set a major league record last season with 267 home runs; now let’s hope to make it 300 this season! This past Thursday, the Phillies beat the Braves 10-4. Phillies’ Andrew McCutchen led off the bottom of the first with a home run off Julio Teheran. Maikel Franco added a three-run homer and Rhys Hoskins put it away with a seventh-inning grand slam. Bryce Harper went 0-for-3 with a walk and two strikeouts. Finally, the Mariners beat the Red Sox 12-4. The Mariners pounded Chris Sale for seven runs, including three home runs in three innings (a game total of five). Tim Beckham was 0-for-15 with nine strikeouts against Sale, homering off him twice. Sale averaged 95 mph with his fastball last season, but averaged only 92.3 on Thursday. While Red Sox Nation is in full-panic mode, as they say, it is going to be a long season. Don’t ever overreact on Opening Day (espn.com).